First things first, I hope you've all had a lovely Christmas! Now on to the sales.. I've done quite well in the sales so far picking up a black and white boucle jacket (I've been searching for one for ages) in the Next sale with 50% off and some make-up from the Emotional Brilliance range at Lush with 50% off! I've also been browsing the sales online over the past few days and I've compiled some of my best buys from both the high street and some designer items with great discounts! One of my best buys in the sales last year was a Benefit set, in 'Fast Train to Fabulous' you get a full sized POREfessional and Benetint and a They're Real! mini mascara. To buy the POREfessional on its own costs £23.50 so you can see what a great saving this is! The post Christmas sales are a great time to find a half price winter coat, I haven't bought a new coat yet this season so I'm on the lookout! This military style coat with a peplum waist from Topshop is one of my current favourites. I love the studded slippers from River Island and at just £15.00 I'm tempted to buy them in black too! I've been looking for a new purse for a while and have fallen in love with this purple flap over purse from Biba. It has enough room to hold my numerous store cards and cash and I love the Biba logo on the front. I've become a little addicted to shopping for designer accessories (as my bank balance won't allow my dream designer wardrobe!) I love the print on this Versace scarf, it's perfect for adding a touch of Versace to your outfit on a budget. There's some great savings to be had in the Mulberry sale. 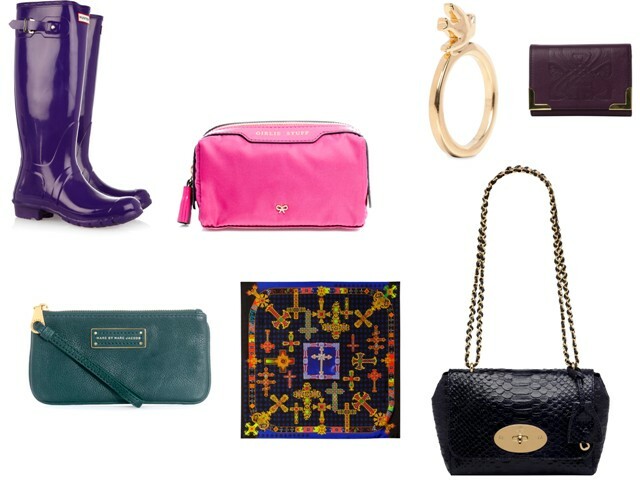 I sadly don't currently have £486 to splash on a new Mulberry bag but a girl can dream! Do you prefer finding designer items or sticking to the high street sales? Have you picked up any bargains in the sales? I hope you get a lovely haul, Caroline! I would lurve to snag that Mulberry purse. WOW! I haven't been shopping at all since November. I did get some books after Christmas, but that's pretty much it! Eeeeep, why did you show me that M by MJ purse? Crumbs, I want it real bad. What a bargain! Nice post! The Hunter wellies are quite a bargain!